How To Clean Jewelry At Home: Tips For Cleaning Yellow Gold, White Gold, Platinum …And Diamonds! Place gold ring with diamonds inside. Swish the ring around using a kid-size toothbrush (that’s only used for cleaning jewelry). Put ring on left pointer finger and use the toothbrush’s soft bristles to gently remove dirt and debris from top of the diamonds. Take off ring to clean underside of the diamonds, making sure the sink drain is plugged or closed off. Rinse thoroughly with hot water from the faucet — with the ring still on left pointer finger (and the drain still closed). This is a jewelry cleaning process that I learned from a jeweler years ago when I acquired my first piece of gold jewelry with diamonds: my wedding ring. 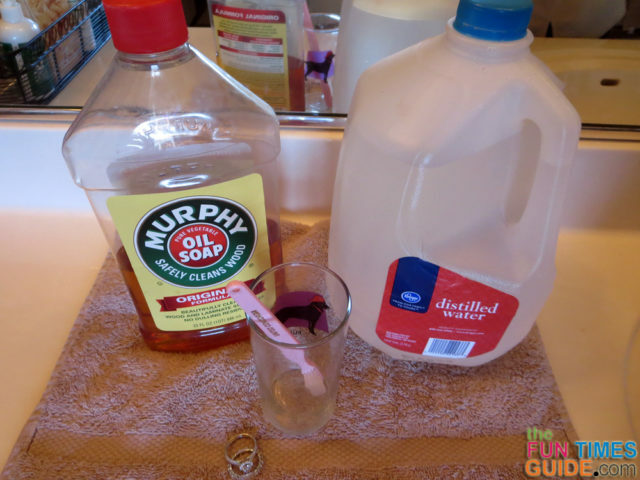 Through the years, I’ve found a few other people who also use Murphys Oil Soap to clean jewelry, but it seems to be a little-known secret for the most part. It has worked perfectly for me for the past 15 years. With my DIY jewelry cleaning solution, I can buy the cleaner in bulk and it will last for years! Plus, I don’t have to find space on my bathroom countertop to use — and store — another handy dandy gadget. If I ever change my mind and decide to try another (inexpensive) ultrasonic jewelry cleaner, this is the one I’d get. Though I would probably want to do some research on true professional-grade ultrasonic cleaners first. Surely, the more expensive ones would work even better and last even longer — right? Recently, for our 15th wedding anniversary, we upgraded my 14-karat yellow gold wedding ring for a 14-karat white gold wedding ring and anniversary band. Wanting to do it right from the get-go, I asked the jeweler how to clean my new rings. Put 2-3 drops of dishwashing soap that has ammonia in it into a small glass. Let it set in this cleaning solution for 30 minutes. Rinse thoroughly with hot water. Use a hair dryer (instead of a lint-free cloth) to dry the ring and make the diamonds sparkle. By the way, this jeweler recommends not using a soft toothbrush to clean diamonds. The reason? He said if a diamond is loose in its setting, using a brush could send the diamond flying and you may not ever find it. Ammonia And A Hair Dryer… Seriously? #1 – Which brands of dishwashing soap have ammonia in them? 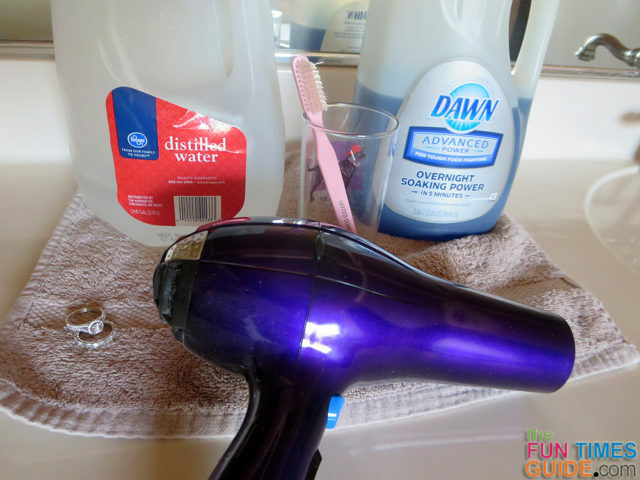 #2 – Use a hair dryer to dry diamond rings… really? So I did some research and found others recommending the same thing: dish soap with ammonia and a hair dryer. Though, I’ll be honest, I also found some people saying that you should never use ammonia on jewelry, and even some say not to use a hair dryer. Since more than one professional said TO do these things, I’ve decided to follow the advice of my jeweler (and others) and use dish soap with ammonia to clean my jewelry and a hair dryer to dry my jewelry. The safest solution is 1 part ammonia to 6 parts water. For the purest formulation, use distilled water (or at least bottled water) instead of tap water — unless you want hard water stains and calcium deposits that are naturally found in tap water to settle onto your diamonds. Distilled water is budget-friendly too. A gallon jug is just 99 cents at most grocery stores! Dawn and Joy Detergent: Ammonia Or Not? Does Dawn Dish Soap Have Ammonia In It? I found bits & pieces from each of those discussions helpful when determining how to clean jewelry at home myself. By the way, my jeweler’s recommendation to not use a soft toothbrush makes perfect sense. But since I’m not a jeweler with the “right” tools to clean all sides of a diamond, I still use a soft baby toothbrush very carefully — because I can’t imagine the liquid solution alone removes all of the body oils, hand lotion, sunscreen, and soap that acquires over time. How do you clean your gold jewelry and diamonds? Have you learned any other tips and tricks that work?